Happy Wednesday! We have a new sketch today at Freshly Made Sketches and it's mine! Yay! I am the host this week! I consulted my note book at work to see what I could find among my doodles in the margins. I think I found a really good one for you. It's very clean and leaves lots of room to be creative and add your own special touches. My first instinct was to pull out one of the new Subway Series stamp sets from Fresh Squeezed Stamps. I've been wanting to get some subway sentiment stamps but hadn't found any that I really like enough to buy until I saw these. And I think they pair nicely with patterned papers so I dug through my 6x6 paper pads and found this great collection of fall patterns and colors. My poor paper pads are getting dusty and lonely - clearly they need more love. I'm gonna have to see what I can do about that! Be sure to stop by Freshly Made Sketches and check out the wonderful creations from the Clean Team! I hope you like my sketch and come and play. I'd love to see your take on it! I can feel the fall weather looking at this. Such a great card for the fall and Thanksgiving. Now I'm hungry! Love this for fall! The leaves are beautiful! Oh I love your card and the new sketch Linda! That fall subway art is wonderful! Such gorgeous work! Some day you're going to have to show us this notebook of yours! Such inspiration it contains! 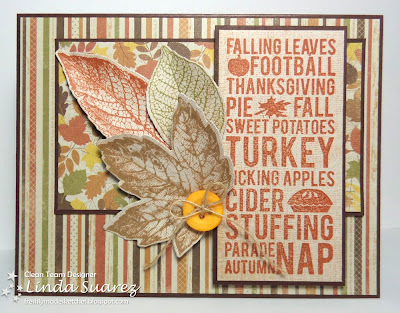 Meanwhile I love cards that celebrate fall and this is gorgeous. I love the cluster of leaves! Those leaves are gorgeous, and I love the subway style stamp. I love your sketch -- it's so versatile! Oh wow I love that stamp you used. Your card is precious. Thanks for your comment on my card. I wanted to do the Fms one and got Vicki's card in my email so when I sat down to stamp a card for my blog today I thought hmm what color and then remembered that I saw hers. Funny I was the first one. Never been before as usually I am just under the wire for a challenge. LOL! Thanks so much. Linda this card is beautiful! I love fall cards! Love all of those leaves and the sentiment! Oh, I could make fall cards all year long!!!! I am IN LOVE with this card! I have never heard of Fresh Squeezed Stamps and just checked them out. Now I'm hooked!!! Thanks for sharing!